Customized Forklift Attachments On Liftomatic Material Handling, Inc. 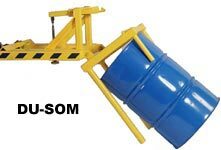 Customized Forklift Attachments for picking up drums, cylinders and a wide variety of customized handling requirements. Send us your drawings or work with our engineers to design a custom made attachment to suit your application.